ARE YOU CURRENTLY OR ONCE WERE A LEADER OF SOLDIERS? ARE YOU CURRENTLY OR ONCE WERE AN NCO? ARE YOU INTERESTED IN NCO AND SOLDIER PROGRAMS? WOULD YOU VALUE THE INSIGHT OR GUIDANCE OF A FORMER SERGEANT MAJOR OF THE ARMY? 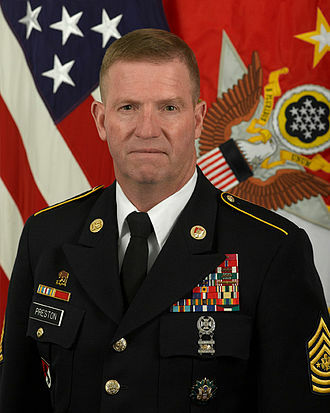 Ken Preston served as 13th Sergeant Major of the Army from January 15, 2004 to March 1, 2011, retiring as the longest-serving SMA. Today, SMA Preston maintains the same focus on Soldiers and families as national Vice President of NCO and Soldier Programs for the Association of the United States Army (AUSA). KC AUSA is pleased to host SMA Preston to speak to our membership and community partners because he understands the dedication and importance of roles fulfilled by all Soldiers in the Army, Army National Guard, and Army Reserve within Kansas and Missouri. Breakfast and NCOPD have separate registrations! REGISTER NOW AT OUR WEBSITE AND/OR EVENTBRITE! NCOPD is limited to 80 guests.